VietNamNet Bridge - The number of renewable energy plants capitalized at VND1.2-1.4 trillion has been increasing rapidly. The Binh Thuan provincial People’s Committee has accepted commitments from 20 investors to invest in the renewable energy sector in the province. This is a part of the province’s plan to become a large energy center of the country in the next few years. These include a commitment to build three wind and power plants by Duc Long Gia Lai Group with total investment capital of VND13.8 trillion. The largest project is the 200 MW Plant to be located in Phan Thiet City, capitalized at VND6 trillion. A representative of Duc Long Gia Lai Group said this is just the first step in the group’s strategy on pouring VND30 trillion into renewable energy and tourism projects to be developed from now until 2030. 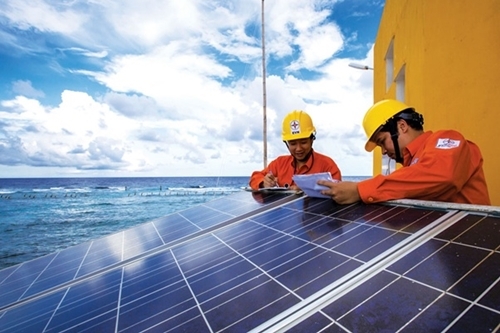 Prior to that, EVNGenco No 3 (Power Generation Corporation) registered the solar power project with expected capacity of 350 MW in Ninh Thuan province. The number of renewable energy plants capitalized at VND1.2-1.4 trillion has been increasing rapidly. The project with investment capital of VND9.576 trillion is expected to be implemented between 2018 and 2021. Binh Thuan and Ninh Thuan are the two provinces leading the country in investments in the renewable energy sector thanks to their favorable geographical and weather conditions. The average radiation intensity is about 5 kWh per square meter. There is less rain than other areas and the number of sunshine hours is at an ideal level. Other localities, such as Khanh Hoa, Quang Tri and Binh Dinh, though having less favorable natural conditions, have also attracted a lot of investors. The Khanh Hoa provincial authorities have recently agreed in principle to two solar energy projects initiated by the Central Region Power Corporation and a local company. The two projects have estimated capital of VND4.3 trillion. Most recently, Fujiwara from Japan has received investment license for the solar & wind energy project in Binh Dinh province, capitalized at VND1.446 trillion in total. The investor committed to kick off the project right in 2017 and complete the first phase of the projects by the first quarter of 2019. More and more enterprises operating in many different business fields have recently shown their great interest in the renewable energy sector. Nguyen Thanh Hung, deputy CEO of Bamboo Capital JSC, said the company is planning to mobilize $300 million between 2017 and 2020, of which $100 million would be poured into renewable energy projects. Nguyen Anh Tuan, director of the Renewable Energy Center, said that investors now rush to invest in the renewable energy sector because the costs have dropped thanks to the development of technology. Several years ago, the wind production cost was VND3,500 per kwh, but it is now VND2,200-2,500 only.